Photography and painting have long contended over a common territory, the faithful representation of reality. Ever since Leonardo da Vinci declared that the highest objective of painting was to create convincing illusions of volume, light and depth on the flat picture surface artists have sought that ideal through assiduous study, visual acuity and manual skill. This centuries old assumption regarding the goal of painting led people to declare the death of painting when the first photographic process emerged in the early 1800s.The camera, with the press of a button, achieved effortlessly what once took an artist years to perfect. Early 19th century photographers struggled to distinguish themselves from the mere button-pushers by finding the Art in these new processes. They did this largely by imitating painting, in a sense appropriating the language of image making that centuries of painters in the west had established. Painters, on the other hand, were quick to use the new medium as an assist in painting. 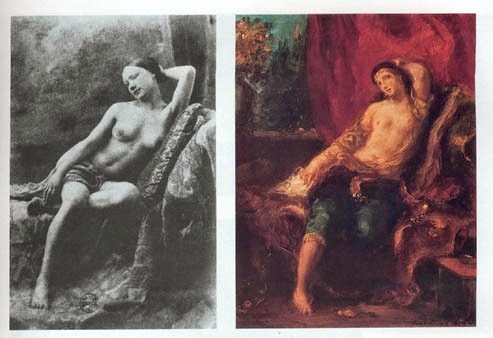 Delacroix is an early example, as is Degas, who left thousands of photographs in his studio at his death in 1927. In these documents we recognize the models for some of his best known paintings. Bonnard and Vuillard also left photographs of their models. And well before the advent of photography the camera obscura and camera lucida shaped the painterly visions of Vermeer and many of his contemporaries. At the bottom of both of these arts, painting and photography, is a basic human fascination and delight in the visual feast that our eyes lay before us from the moment we wake up in the morning. But the similarity between the photographer’s art and the painter’s ends as soon as they take up their respective tools. Students of painting, struggling to appropriate the skills and instincts for making their art, especially need to understand this disparity, and why working from direct observation is still crucial. A camera, as Hockney suggests, produces an instantaneous image, formed in a fraction of a second by a mechanical, or these days, an electronic mechanism. A painting, by contrast, unfolds over a long period of time by slow, manual manipulations of paint. Taking a photograph can often be like casting a fisherman’s net. A lot of stray fish end up in the catch. The casual photographer, unlike the painter, may not have been cognizant of everything that the net of his camera has recorded. A painter, on the other hand, must visit every part of her subject and her canvas, making decisions inch by inch: what color, how dark, how warm or cool, how intense, what texture, what shape and quality of edge. The painter attends to the subject’s totality; not just to isolated objects but to the whole spatial ensemble. The quality of that attention is laid into the paint itself at the moment of making, like jazz improvisation. A stroke of paint is a deposit of the painter’s consciousness on the physical matter of the canvas. By nature the process is accumulative; it builds slowly and circuitously to its climax. Even more importantly, the painter may destroy the image repeatedly on her way to some final resolution. Manipulating photographic imagery in the darkroom or on a computer can approximate this sort of open-ended search but there are important distinctions. With a painting, there’s no original negative, print, or saved state to return to when the piece goes off the rails. In photography the natural hierarchies of light impersonally press their familiar structure onto the image. The photographer guides the camera but the instrument does the rest. The painter by contrast must shape the image by hand; must find the structure all while being buffeted by the anarchy of subjective experience. Painting is like trying to land a plane in high winds. You move the thing forward but it shifts constantly off the path. The momentary encounter with a certain part of the subject, a chair, say, may suddenly open a trap door to childhood memories – the painter can lose the vision of the whole and begin to dote on the individual object. The necessary distancing that allows her to see the relationship of the chair to the rest of the painting is, for that moment, lost. She must then find her way back, repeatedly, to some sense of a hierarchy knitting together the parts of her painting. This is the great advantage of painting, but it is also why paintings can go so wrong. There are so many more opportunities to make individual decisions that don’t relate well to other decisions. The camera, on the other hand, captures a seamless, familiar reality, leaving it to the photographer to concentrate on selection of the motif. The objectifying, organizing power of the photograph can be very seductive for painters, especially students, whose image making culture is dominated by the pervasiveness of internet imagery. Photoshop and its imitators, and platforms like Instagram put tools for making images into everyone’s hands. How different and difficult is the painter’s long study, training and practice with manipulating color in order to realize a particular and individual vision. Who today has the patience to apply himself to this archaic practice, and to suffer through the humbling mediocrity of much of his efforts until some success is achieved? When we work from photographs the hard part of translating the multiple perspectives and shifting aspects of the three-dimensional world into the flat image has already been done for us. In the absence of any formative contact with the long traditions of art, or lacking familiarity with painting’s idioms of form-making, students can fall into the trap of simply appropriating the language of photography with its seductive similitude, intense detail and texture. That’s the essential difference between how the student tends to use photographs in painting and how the masters did it. The vision of artists like Degas and Vuillard was shaped by the study and practice of painting, and by deep contact with the art-making traditions that preceded them before they discovered photography. They knew, or felt how they wanted their paintings to look, and what their paintings had to do in terms of its unique formal language. In the hands of a master, the photographic information is conformed to the painterly vision. For the student, all too often, the instantaneity of the photograph substitutes for the deeper vision that can only be developed through a cultivated love for the medium of painting. …is the title of a book by Alain de Botton. Botton describes the conflicted relationship to work that many people experience in their lives, and he draws a poignant comparison with the experience of the craftsman’s work. In a job, he says, “…Our exertions generally find no enduring physical correlatives. We are diluted in gigantic intangible collective projects, which leave us wondering what we did last year and, more profoundly, where we have gone and quite what we have amounted to. We confront our lost energies in the pathos of the retirement party. How often when painting do we put down a color patch, a mark, or a brushstroke that just doesn’t hit the note we’re after? Too often. The many ways that our moves on the canvas can be off are dauntingly large. The value can be too dark or too light. The hue and temperature can fail to mesh with the existing colors. They might pop out or sink in, or create a jarring discord. The drawing – things that affect the rightness of proportion, or the readability of the space – can go off track, creating strange distortions. Our first reaction is to think we’ve made a mistake! A mistake is something that is not correct, an inaccuracy. But what if we change the way we look at, and think about, this apparent disaster? Learning to paint is not just about learning techniques, it’s about appropriating new eyes and a new mind for considering this fraught enterprise in which we’re engaged. What if we stop thinking about that bad color note as an isolated “incorrectness” and instead consider the whole context in which this misstep appears defective? Sometimes a mistake is a gift in disguise. Miles Davis, the great jazz trumpeter, gives us a new way to think about these so-called mistakes. Everything depends, he says, on what comes next. The next notes you play can either confirm and compound the sense of wrongness, or they can begin to welcome that mistake into the ensemble and make it meaningful, even revelatory. A mistake is what we make when we’re following a preconceived aim and a piece of the puzzle doesn’t fit. If we stay open to what happens we have the potential of following the work into some very interesting territory. The many gaps between what we think we’re doing and what actually happens is where a lot of the excitement of painting happens. Thinking of painting as a kind of visual improvisation, rather than a step by step process, opens new doors. It gives us a whole different set of sensitivities with which to solve the problems of a particular painting. I was privileged as a young student to participate in a workshop at Mountain Lake in Virginia in the early 1980s, organized by my teacher, Ray Kass, from Virginia Tech. I imagined that Thiebaud would be a kind of Oscar Wilde-like character, as colorful and flamboyant as his delicious paintings of pies and cakes that were very much defining the contemporary art world at that time, the world that I, as a young painter, was preparing to enter. What I found instead was a deeply humble man who wasn’t much interested in talking about himself, his work, or his reputation. We spent an evening looking at old, brown masters of the past – Chardin, Rembrandt, Tintoretto and others – while Thiebaud held forth on his deeply held belief in the need for painters to work at acquiring the disciplines of looking and seeing the world around them. Here’s an instructive excerpt of a talk by Wayne Thiebaud given at the New York Studio School in 1999. In it he articulates in his wonderfully clear, no-nonsense way, some of the same values that he shared with us those many years ago. Stanford University has launched an interactive website containing all of the sketchbooks of Richard Diebenkorn, 1922-1993. Click the drawing above to visit the site.